Die Martis, 23 Novembris, 1647. Petition from free-born People of England. ORDERED, That Mr. Solicitor do prepare and bring in an Ordinance for Supply of that Defect which is occasioned by reason Bishops are taken away, and cannot give Certificates of the Conformity of Papists. A Letter from the Mayor and others of Bristoll, of 20 Novembris 1647, was this Day read; representing That the Soldiers there are mutinied, and have taken away one Alderman Browne, and carried him Prisoner to the Great Fort, and will not release him without a Month's Pay, Security for their Arrears, and an Act of Oblivion for this Fact. Ordered, That Mr. Prideaux do prepare a Letter to be sent to the General: And that this Letter from Bristoll, be inclosed: And he desired to take care of this Business, to examine it, and report it to the House; to take care to prevent the like for the future; and to give Order for the present Discharge of Alderman Browne. Ordered, That Sir Henry Worseley and Mr. Horner, Members of this House, shall have Leave to go into the Country for Six Weeks. An Ordinance for Relief and Employment of the Poor, and Punishing of Vagrants, and other disorderly Persons, was this Day read the Second time; and, upon the Question, committed unto Colonel Thompson, Mr. Lane, Sir Wm. Massam, Colonel Ven, Mr. Whitelock, Mr. Challoner, Sir John Danvers, Sir Benjamin Rudiard, Mr. Holland, Sir Wm. Allenson, Mr. Bond, Mr. Miles Corbett, Sir Walter Erle, Sir Robert Pye, Mr. Temple, Sir Richard Onslowe, Mr. Gourdon, Mr. Jesson, Mr. Dove, Mr. Wheeler, Sir Martin Lister, Mr. Sam. Browne, Mr. Leman, Mr. Whittacre, Mr. Lisle, Mr. Annesley, Captain Skinner, Mr. Bulkeley, Mr. Love, Alderman Atkin, Mr. Strode, Mr. Vassall, Mr. Scott, Mr. Edward Ashe, Mr. Aldworth, Mr. Westrow, Mr. Swynfen, Sir John Francklyn: And all that will come are to have Voices: And are to meet on Thursday next, at Two post meridiem, in the Exchequer Court: And the Care of this Business is more particularly referred to Mr. Miles Corbett. Ordered, That, on Friday next, the first Business peremptorily, the Reports concerning Ireland be made. Ordered, That the Report concerning a List of divers Scotts Officers be made on Thursday Morning next, after the Reports of Goldsmiths Hall. An Ordinance prohibiting the Transportation of Wool, Woollen Yarn, Fullers Earth, and Clay, was this Day read the First time; and ordered to be read the Second time on Friday Morning next. Ordered, That Colonel White do, on Friday next, report the Ordinance for taking away the Obstructions in the Sale of Bishops Lands. Ordered, That Mr. Framlingham Gaudy, and Sir Wm. Springe, Members of this House, shall have Liberty to go into the Country for Six Weeks. Resolved, &c. That the Business and Information concerning Mr. Edward Stephens and Mr. Gewen be committed unto the Members of this House that are of the Committee appointed to examine the Force upon the Houses: And they have Power to examine Mr. Stephens and Mr. Gewen in the said Business. Resolved, &c. That there be an Addition to this Committee; viz. Mr. Swynfen, Mr. Bois, Mr. Erle, Mr. Bond, Mr. Crew, Sir Ralph Ashton, Mr. Reynolds, Lord Lisle, Mr. Bulkley, Mr. Challoner, Captain Wingate, Mr. Nath. Stephens, Mr. Wheeler, Mr. Tate, Mr. Hobby, Sir Wm. Constable, Colonel Purefoy, Mr. Leman, Mr. Love, Sir Symonds D'Ewes, Mr. Rose, Sir Peter Wentworth, Mr. Dodderich, Mr. Waddon, Colonel Booth, Mr. Holland, Sir Walter Erle, Mr. Edward Ashe, Mr. Jesson, Mr. John Corbett, Sir Wm. Massam, Sir Anthony Irby, Sir Wm. Allenson, Mr. Knightley, Sir Richard Onslow, Mr. Temple, Mr. Green, Sir John Curson. 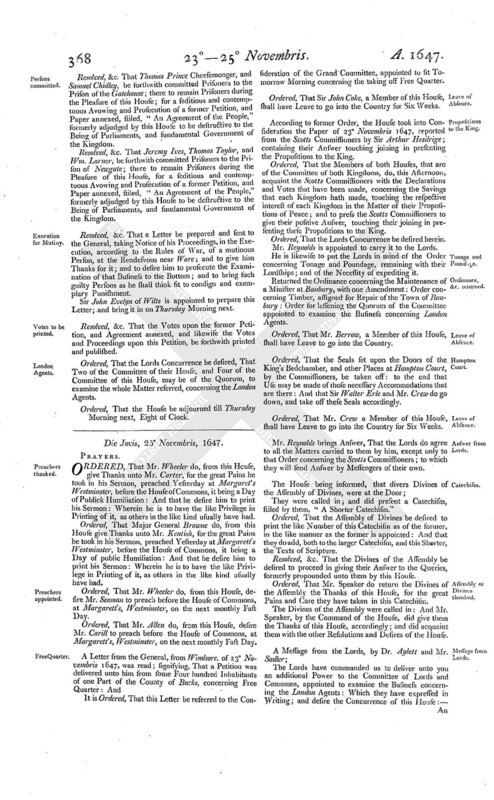 The Lords have commanded us to deliver unto you a Letter for the Scotts Commissioners, in Answer to Two of theirs, of the Fifth and Seventeenth instant; in which the Lords desire the Concurrence of this House: The List of the King's Servants; in which they concur; with the Addition they have here returned: An Ordinance concerning the Disposal of the Rectory of Allhallowes in Lumbard Street to John Cardell; in which the Lords desire the Concurrence of this House: An Ordinance for the Minister of Banbury; in which they desire the Concurrence of this House: An Order for referring to the Committee of Foreign Affairs the Matter of Trade: It moved first from this House: To which they have made one Alteration; in which they desire the Concurrence of this House. The Lords desire to put this House in mind of the Petition of Captain Wm. Jones formerly sent to this House: That the Lords have appointed their Members of the Committee of both Kingdoms, to meet this Afternoon at Derby House. They do recommend to the Consideration of this House, the Petition of the Lady Mary Cawfield Widow: An Ordinance to make Mr. Grant Rector of Astley in the County of Worcester; in which they desire the Concurrence of this House. It is Ordered, That it be committed unto Sir Peter Wentworth, Mr. Marten, Mr. Hill, Mr. Scott, Mr. Lisle, Mr. Morley, Mr. Bois, Mr. Wheeler, Mr. Allen, Mr. Rigby, Mr. Scawen, Mr. Pierepoint, Sir Arthur Hesilrige, Mr. Nath. Fienis, Mr. Solicitor, or any Three of them: And they are to meet this Afternoon, at such Time and Place as they shall think fit: And are to bring it in on Thursday Morning next: And the Care of this Business is more particularly referred to Sir Peter Wentworth. It is Ordered, That this Paper be taken into Consideration on Thursday Morning next, when the Letter in Answer to the Scotts Commissioners shall be reported. Resolved, &c. That, for the Space of Fourteen Days, nothing shall be moved, or taken into Consideration, except only what concerns the Settlement of the Peace of the Kingdom, providing for the Army, and taking off Free Quarter, providing for the Navy, and the Affairs of Ireland. Lieutenant General Cromwell, Sir Walter Erle, Mr. Knightly, Mr. Bond, Mr. Marten, Mr. Swynfen, Mr. Purefoy, are appointed presently to withdraw, to open the Packet sent in; and report their Opinions to the House, whether it be fit to be read in the House. Ordered, That Colonel Booth shall have Leave to go into the Country for Six Weeks. The Addition to the List of the King's Servants was read; and, upon the Question, assented unto; and was, for the Adding of Mr. Maxwell, Mr. Maule, and Captain Middleton, to the said List. Ordered, That it be referred to the Committee of the Revenue to advance an Hundred Pounds, for defraying the Expences of the Servants going down to attend the King, and the Charge of Carriages necessary to be employed in that Service. The Ordinance for disposing of the Rectory of Allhallows in Lumbert Street to Mr. John Cardell, an orthodox Divine, and making him Rector thereof, was read; and, upon the Question, passed. The Ordinance, sent from the Lords concerning the better Maintenance of the Ministry in Banbury was read; and the Words "Twenty fifth of March, and Twentyninth of September," being added, instead of these Words, "Two most usual Feasts in the Year, that is to say, at the Feast of the Annunciation, and St. Michaell the Archangel;" the Ordinance, upon the Question, passed. Ordered, That the Corporation of Banbury shall have Liberty to sell the Timber, in the Place where it is, by former Order, assigned unto them, for Repair of their Town; and, with the Proceed thereof, buy so much Timber in some Place more convenient for those Purposes; the Timber now assigned being so far remote and distant from the Town of Banbury, where it is to be employed, that the Charge and Expence of Carriage will near amount to the Value of the Timber. 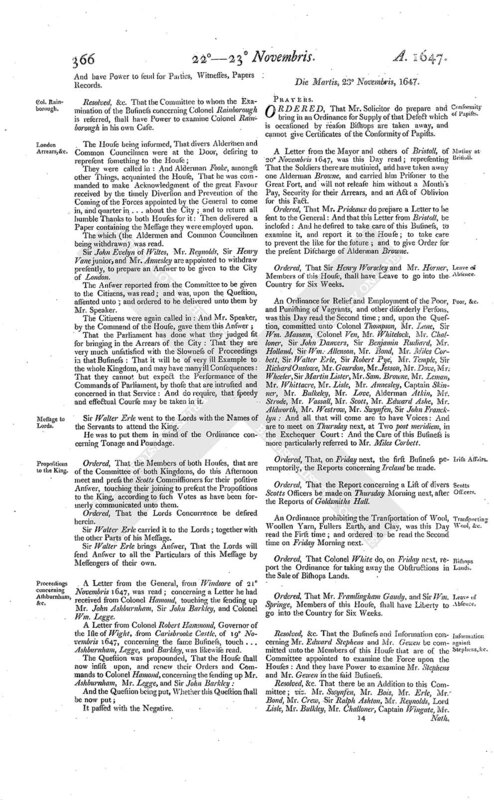 The Alteration to the Order concerning the Referring the Matter of Trade to the Committee of Foreign Affairs was read; and, upon the Question, assented unto. An Ordinance to make Mr. Grant Rector of Astley in Com' Wigorn', now sent from the Lords, was read; and, upon the Question passed. Answer returned by the same Messengers; That this House has considered their Lordships Message: And do agree to the Addition to the List of the King's Servants: To the Ordinance concerning the Disposal of the Rectory of Allhallowes in Lumbard Street to John Cardell: To the Addition to the Order for referring to the Committee for Foreign Affairs the Matter of Trade: To the Ordinance for making Mr. Grant Rector of Astley: To the rest, they will send Answer by Messengers of their own. An Ordinance for constituting and making Mr. Nicholas Paul, an orthodox Divine, Vicar of the Church and Parish of Berkley in the County of Gloucester, was this Day read; and, upon the Question, passed. Memorandum, There were Testimonials read, certifying the Sufficiency and Fitness of Mr. John Cardell, to be Rector of the Rectory of Allhallowes in Lumbard Street; of Mr. Grant to be Rector of Astly in Com' Wigorn'; of Mr. Nicholas Paul to be Vicar of the Parish of Berkley in the County of Gloucester; before any of the said Ordinances passed. It is Ordered, That the Commissioners of the Customs do suffer the said Company to pass upon the said Ships Dolphin, Bointoe, and Advice, Foreign Coin and Bullion, to the Value of Forty-five thousand Pounds, in manner as formerly hath been ordered and granted. 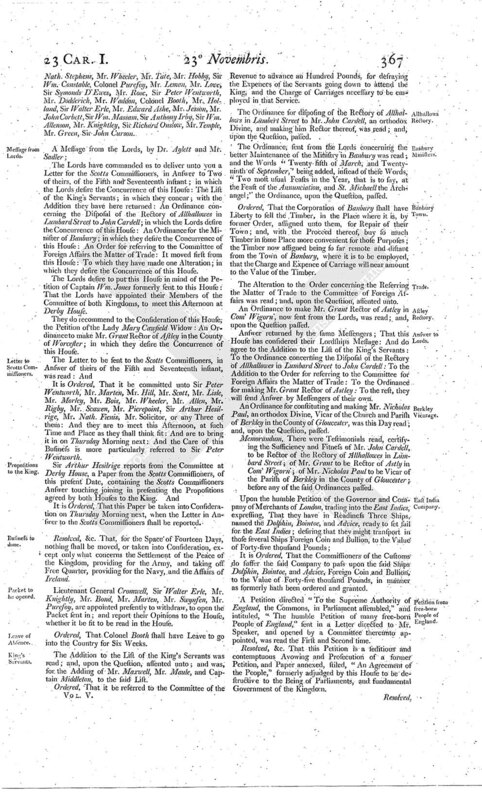 A Petition directed "To the Supreme Authority of England, the Commons, in Parliament assembled," and intituled, "The humble Petition of many free-born People of England," sent in a Letter directed to Mr. Speaker, and opened by a Committee thereunto appointed, was read the First and Second time. Resolved, &c. That this Petition is a seditious and contemptuous Avowing and Prosecution of a former Petition, and Paper annexed, stiled, "An Agreement of the People," formerly adjudged by this House to be destructive to the Being of Parliaments, and fundamental Government of the Kingdom. Resolved, &c. That Thomas Prince Cheesemonger, and Samuel Chidley, be forthwith committed Prisoners to the Prison of the Gatehouse; there to remain Prisoners during the Pleasure of this House; for a seditious and contemptuous Avowing and Prosecution of a former Petition, and Paper annexed, stiled, "An Agreement of the People," formerly adjudged by this House to be destructive to the Being of Parliaments, and fundamental Government of the Kingdom. Resolved, &c. That Jeremy Ives, Thomas Taylor, and Wm. Larner, be forthwith committed Prisoners to the Prison of Newgate; there to remain Prisoners during the Pleasure of this House, for a seditious and contemptuous Avowing and Prosecution of a former Petition, and Paper annexed, stiled, "An Agreement of the People," formerly adjudged by this House to be destructive to the Being of Parliaments, and fundamental Government of the Kingdom. Resolved, &c. That a Letter be prepared and sent to the General, taking Notice of his Proceedings, in the Execution, according to the Rules of War, of a mutinous Person, at the Rendesvous near Ware; and to give him Thanks for it; and to desire him to prosecute the Examination of that Business to the Bottom; and to bring such guilty Persons as he shall think fit to condign and exemplary Punishment. Sir John Evelyn of Wilts is appointed to prepare this Letter; and bring it in on Thursday Morning next. Resolved, &c. That the Votes upon the former Petition, and Agreement annexed, and likewise the Votes and Proceedings upon this Petition, be forthwith printed and published. Ordered, That the Lords Concurrence be desired, That Two of the Committee of their House, and Four of the Committee of this House, may be of the Quorum, to examine the whole Matter referred, concerning the London Agents. Ordered, That the House be adjourned till Thursday Morning next, Eight of Clock.